In all, this year’s class of graduates come from 20 different states, from Hawaii to Florida and New York. The vast majority come from California. The second most represented state is Arizona followed by Colorado. But not all are from the United States. The class includes residents of six different countries including England, Spain, Japan, Taiwan, Singapore and Sri Lanka. Moreover, the class represents many different nationalities, backgrounds and academic interests. 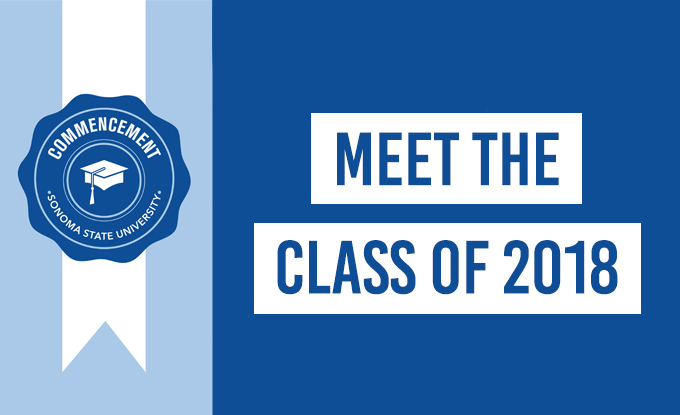 What follows are profiles of a handful of the members of the Class of 2018. Click on each students name for an in-depth profile. When Sastra McGinley left a decade-long career to attend college, she wasn’t sure what she wanted to study. She knew only that she wanted to make the world a better place. Now, 10 years after her educational journey began, McGinley is graduating from Sonoma State University with a B.A. in environmental studies and a new-found passion for helping the planet. Emma Towslee knows what it’s like to suffer setbacks. The soon-to-be graduate in biology with minors in chemistry and business, has to live with one that has set her back for the past four years. Her freshman year she was diagnosed with type 1 diabetes.